Leapfrog will work with partners who engage community groups and individuals creatively to map a shared terrain of characteristics, motivations and barriers for adapting and appropriating tools in their own practice. 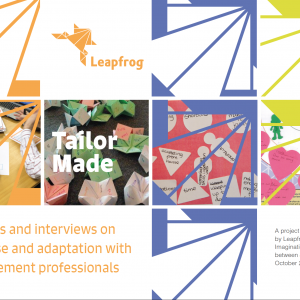 Our purpose in Leapfrog is to equip engagement practitioners with flexible tools they can adapt or appropriate when the circumstances require it. Leapfrog has explored tool versatility so far through designing: interactive PDFs and power point templates that offer varying degrees of customisation to text and image; tools made up of many parts that can be used in isolation or combined with other parts or tools and; providing guidelines with tools for how they can be transferred into different contexts. This has been based on our work with partners so far and our practical knowledge as designers of what could make a tool flexible. In Tailor-​Made, we will look closely with partners who engage creatively with individuals, families, groups and communities, at the characteristics, motivations and barriers for using tools flexibly. Following on, they will map out changes, re-​creations, re-​mixes they make to tools in practice and reflect on their tool-​use practice. Use the accounts given in the Leapfrog community engagement survey to start mapping the terrain of how people might be using and changing tools. Feed accounts of tool adaptation into a report of activity and emerging insights.